Is Your Fired Ware Safe? In the 1950's, chemical companies operated under the banner "better living through chemistry". We all know how that turned out! Like a teenager, their new-found technology convinced them that they knew it all. But we have matured and realize we know very little. It begs the question: What do chemists know now that each of us as potters and technicians can work with to produce products that are as safe as possible? All glazes and glasses are slowly dissolving. Stable glazes just dissolve slower. So we are aiming at a moving target, but in general, we want to achieve glazes that dissolve slow enough that we can barely detect it with sensitive instruments. Leaching glazes can have either an acute or chronic effect; however, the former is rare. Chronic effects are difficult to recognize and even more difficult to trace. A chronic effect of barium, for example, is high blood pressure. Since so many people have high blood pressure, it means that barium poisoning will be just about impossible to recognize. Therefore, the burden is on the manufacturer of the ware to make double sure that barium will not leach or emulate its effects using a safer oxide like CaO or SrO. Many well known pottery instructors encourage making glazes almost totally by trial and error on the material-mixing level, considering only aesthetics. They tell us to use these for non-functional purposes, but these labels are quickly lost by 'visual' people so taken by the interesting surfaces of flux and metal saturated glazes that they lose all interest in safety. If unstable glazes result by unbalanced formulations, I think we can safely assume that they also result from trial and error ones. I repeatedly see beginning potters employing toxic recipes from an "if it looks good use it" attitude (i.e. 30% barium, almost no silica or alumina, high metal content). The lower the temperature the more the potential for danger. At high and middle fire, by simple brute force, we can melt high silica and alumina glazes which are inherently more stable. Lower temperatures require more know-how, more expensive materials, and more critical control of process and mixing factors. Thus there are more mistakes to be made and more serious results when things deviate. We have a high degree of confidence that glazes made from kaolin, silica, feldspars, talc, dolomite, whiting, and wollastonite are safe. These materials provide mechanisms to produce almost any visual effect imaginable. Thus if you or your business does not have testing equipment to evaluate leaching behavior, or if you are not prepared to contract this testing service to someone else, it seems logical that you can protect your workers and customers by employing materials like the above. A glaze is a structure made conceptually from oxides. These bond in preferred ways according to what the chemistry and firing permit. While there is a symmetry to the molecular structure of a crystal, a glass is so random that some claim that it is not even molecular in nature. The integrity of the structure is related to the balance of molecule types and limit tables make an attempt to summarize this balance. An imbalance means "loosely attached" molecules can be removed by oxidation or leaching of acidic or alkaline liquids. Lead is an excellent example of this. It can be used safely in a balanced glaze to produce stable and acid resistant containers (the same is true for barium and manganese). Whether most people know it or not, these materials are being used safety in commercial ware and since engineers stick within well defined limits. In many cases, it doesn't really take a rocket scientist to recognize an unbalanced glaze. For example, 2% manganese in a glaze is probably OK, but surely a 20% "saturated" should raise your eyebrows? Most potters and small companies have little access to the materials safety databases of government and industry. 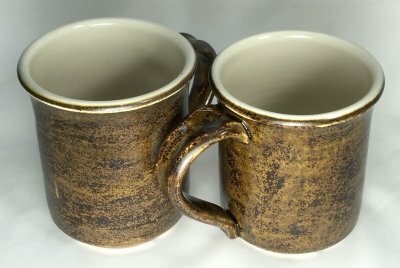 This fact seems to obligate them toward a conservative approach, using clay and glaze formulas and firing techniques that are traditional and understood. Remember also that the chemistry of a glaze is not the only consideration relating to its solubility in food and drink. A glaze must have enough heat to properly melt and bring into solution all of its constituent oxides. If it is not given the necessary time and temperature, glaze building is incomplete. The glass will be unstable and subject to mechanical and acid attack. A true matte glaze solidifies to the required reflectance properties because it has a low SiO2:Al2O3 ratio, or it has a micro-crystalline gloss surface. Needless to say, a true matte glaze is stable, functional, and safe. It is actually not rocket science to test for leaching. John Hesselberth has done a lot of work in recent years studying the issue of leaching, you can find out more at his web site at www.frogpondpottery.com. One test he recommends is to simply put a lemon slice on a glazed plate or tile overnight and look for changes in gloss or color (amazingly, lemon juice is more acidic that vinegar). It can be quite remarkable how it can leach the color out of some glazes. Since bases (e.g. detergents) can also leach glazes, (not just acids) another interesting test is to leave one of two identical pieces of ware in your dishwasher for a few months and then compare them for differences in surface quality. If you would like more information on leach testing see the links below about test procedures and having your glaze tested at a lab. Crazing glazes are 'stretched' onto the ware and crack to relieve the stress. The cracks can host bacteria colonies, especially if the underlying body is porous and therefore keeps the micro-environment damp. Crazing of a liner glaze will also expose metallic slips underneath that it is supposed to be covering. Crazed ware will not pass restaurant inspection. At Digitalfire we provide a lot of information of dealing with this issue. Glaze chemistry really shines in the area of thermal expansion adjustment of fired glazes. The are many ways to tune the chemistry of an offending glaze while having a minimum effect on its fired properties (or improve them at the same time). If you need the best possible control you should measure the thermal expansion of your body and glaze on an ongoing basis using a dilatomter or having a lab do it. Shivering glazes are another issue. If the glaze is overly compressed onto the ware and is being squeezed it can relieve the stress by flaking off at edges. This is a serious situation since these glassy flakes with knife edges could be ingested. Shivering is not nearly as common as crazing. It is most likely to happen on bodies very high in silica (highly plastic super high ball clay stoneware bodies have become popular in recent years and are an example). Unusual glazes such as those high in lithium or magnesia with accompanying high silica can shiver (this is most likely at higher temperatures). Situations where the glaze body bond is not as good also need extra vigilance. (Articles) Crazing and Bacteria: Is There a Hazard? A post to a discussion on the clayart group by Gavin Stairs regarding the food safety of crazed ware.